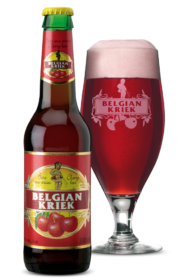 Belgian Kriek is a Belgian kriek beer following an original principle developed by the Brasserie Lefebvre, Belgian Kriek is blended from white beer and fruit juice, it has an alcohol content of 3.5%. Following an original principle developed by the Brasserie Lefebvre, Belgian Kriek is blended from white beer and fruit juice. In this instance, 15% sour cherry juice is added. From the white beer, Belgian Kriek takes a refreshing sweetness and its creamy head. The cherry juice lends a fine rich red colour, a delicate acidity and its fruity bouquet. It has an emphatic cherry nose. The slightly tangy first sip is counterbalanced by a rich sweetness on the palate. The finish is fresh and without a bitter aftertaste. A magnificently balanced beer which deserves its nickname, Mon Amour.